If I cross a high white tricolor to a tricolor with only a bit of white, do I stand a chance of getting a tricolor with a balanced amount of white, or is there a better way to do this? You might get the best answer by asking someone who breeds marked varieties. From what I remember of the dutch breeders on FMB talking, that seemed to be exactly what they were suggesting, but it was never important to me, as I don't breed piebald varieties deliberately. Oh my goodness, sign me up for one of their future babies! Since the intended mix is halfway between the two you've got, I'd say you stand an excellent chance! Oh, good! I was not sure if s/s worked in this commonsense way. Glad to know it does. It's not the s/s, but the k-factors, apparently? It's a combination of how much white and the location of the white spots. Aye, k-factors. I need to understand more about k-factors. Where can I go? 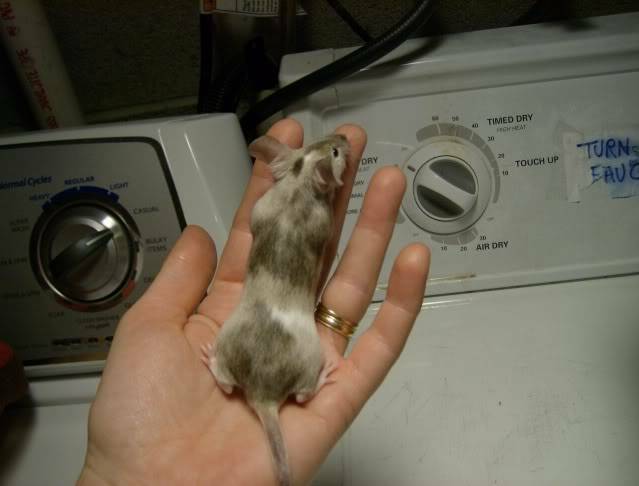 As already noted stocks of s/s mice may differ widely with regard to the amount of white areas in their coats. Thus by selection and inbreeding it is possible to establish reasonably stable lines of piebald animals which are either essentially all white with very few pigmented areas (hereafter referred to as the "all-white" line), or, have very little spotting, amounting to 10% or less of the coat ( Dunn and Charles, 1937). Lines selected for intermediate amounts of spotting are much more variable. This situation appears to reflect the fact that whereas most of the variability in the all-white and predominantly pigmented s/s stocks is due to nongenetic causes, both genetic and nongenetic factors influence the variability in the intermediately spotted stocks. To determine whether these different lines had different piebald alleles or possessed the same "main gene," s, with different sets of "modifiers," Dunn and Charles raised an F2 population after crossing an all-white line with a dark line. 7 It follows that if distinct s alleles were responsible for the different amount of spotting in the two parental stocks, this F2 population should display a trimodal distribution and the extreme parental types should not be recovered. In actual fact, however, these types were not present as the F2, like the F1, displayed intermediate amounts of spotting with a unimodal distribution, though it was more variable than the F1. It thus appears that the all-white and mostly pigmented piebald lines did not possess different " s" genes but differed by a number of "modifying" genes which recombined freely with each other and had cumulative effects. This conclusion was substantiated further by the results of backcrossing F1 animals to the all-white line. Indeed, a rough estimate from this backcross indicated that at least three modifying genes were involved ( Grüneberg, 1952). 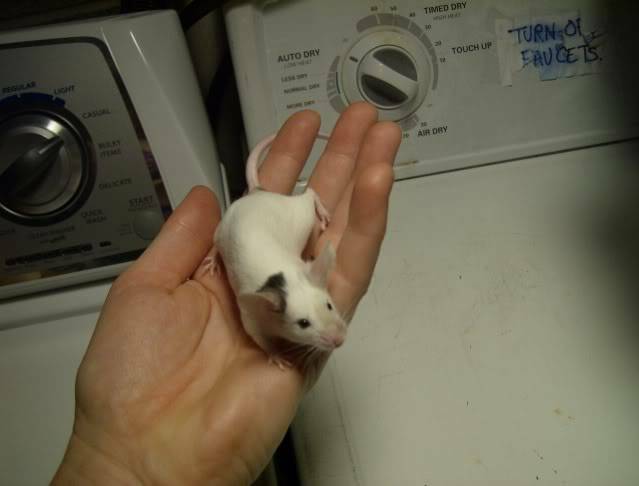 To study the nature of these "modifiers," Dunn and Charles outcrossed their all-white s/s mice with mice that putatively did not possess any spotting genes at all. Since the F1s from such crosses were either fully pigmented or had very small spots on the belly or forehead, it seemed that the all-white type behaved very nearly as a complete recessive when s and all the "modifying" factors were heterozygous. When these F1 animals were backcrossed to animals of the all-white stock two groups of spotted mice, corresponding to the genotypes s/+ and s/s, were evident. Although the s/s group possessed much more spotting than the s/+ group, nevertheless, animals of the latter group displayed much more dorsal white spotting than the F1, presumably because some of the "modifiers" were really not modifiers in the strict sense but were spotting genes in their own right. Dunn and Charles assigned the name of " k" genes to these modifiers and, starting from this first backcross generation, repeatedly backcrossed the lighter s/+ animals to the all-white stock. In this way a population was established in which all of the " k" genes were homozygous in both s/+ and s/s animals, a situation which was evidently complete, or nearly so, from the fourth backcross onward. It seems evident that in the absence of " k" genes (or in the presence of their normal allelomorphs), s is almost completely recessive to + and in the absence of s the " k" genes too are almost completely recessive. On the other hand, these " k" genes act as semidominants in the presence of s/s. In other words "the dominance of s is influenced by the presence or absence of the ' k' genes, the dominance of the ' k' genes is influenced by the presence or absence of s" ( Grüneberg, 1952). The "k" complex has been analyzed further by Dunn ( 1942) and it seems to consist of a large number of genes which, individually, have very small effects. At least one of these genes is dominant since when spotted mice from a " k" stock were crossed with DBAs, a strain devoid of spotting and putatively devoid of " k" genes, all F1 animals were spotted either on the tail, belly, or both. The exact number of dominant " k" genes is not known, but the frequency of spotting in F2 and backcross populations of this outcross indicated that there was more than one and probably two. Dunn also established several sublines from the F2 generation of this outcross which he subsequently inbred. Of these, two showed a type of spotting like the original " k" stock, though of lesser degree, one showed tail spotting only, and one displayed no spotting. Nevertheless, this last stock proved to be different from the unspotted DBA parental strain in that when crossed with various spotted lines, the resulting F1 exhibited much higher degrees of spotting than when the same spotted lines were crossed to DBA mice. It therefore seems evident that the extracted "self" line differed from a real "self" line by the possession of " k" genes which by themselves could not produce spotting but which, when combined with other spotting genes, could not exert a noticeable effect. As emphasized by Grüneberg such "subthreshold" spotting genes are, in a manner of speaking, "specific modifiers" in that they are not phenotypically expressed in the absence of other genes. On the other hand, they seem to differ from "minor" spotting genes which do manifest themselves only by the fact that their influence is not as great." YO! Are you WONDERFUL!!!!!!! Thank you!!!!!!!!! [Next morning.] Laigaie, what does + mean, as in "s/+"? Is it the same as *, meaning "it could be anything"? I'm thinking it might mean "unknown gene" or something? Ah! Thank you! Now I can read past the second paragraph and understand what is being said. Thank you very much, Dino. Woah! Sorry for not answering your question! When there's an edit to an existing post, it doesn't make the post "new" and unread again, so I didn't know you'd asked. + is just a lazy shorthand most of the time. It can be helpful if you need to specify "wild type" for situations where "wild type" isn't dominant over the mutations. Thanks, Laigaie. I still have questions about that + in some of the later paragraphs, but the Jax stuff is so condensed I need to read it several times and let it settle in before I can distinguish between what I do and do not understand. Do the later paragraphs make sense to you? I get the sense that they crossed "putatively" S/S mice with s/s mice and got some s/s mice. Ehhhhhh? I am not at all sure what they're going on about there. It sounds like they were getting spotted mice when they didn't expect to, which happens all the time really. Well, "putatively" ("reportedly") S/S mice does mean "you can never be sure you've eliminated a recessive gene"!